Well, what a summer it’s been! We’ve won award after award for our produce, and we’ll soon learn if we’ve won for our Welsh Black Beef in the Delicious Magazine Awards in London in October! 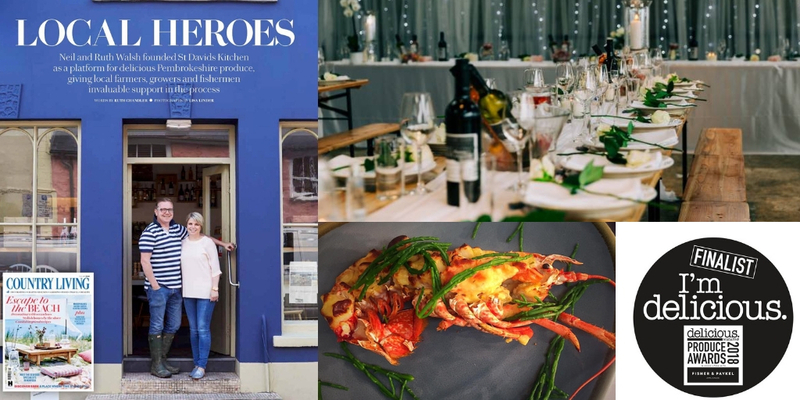 We had an amazing photo spread in Country Living Magazine published in July, and we’ve also been accredited as a Living Foundation employer, the only restaurant to have achieved this in west Wales. We love bringing the best of Pembrokeshire produce to you, so now that it’s getting a bit quieter and we wait for the wilder winter weather, we’re challenging ourselves to mix things up a bit. We’ve recently opened our farmyard up as an events space called “The Yard,” so if you’re after some great-quality food and drink from our catering van and horsebox bar, and to have a bit of a dance afterwards, come and check it out. Back in the kitchen, we’re introducing tasting menu evenings, to let the talents of our chefs shine through, showcasing the best of what we can do, with wine pairings suggested by Ali, our local wine merchant. We’re also introducing our “Sunday Social,” where we’ll mix the highest-quality ingredients and our attention to detail with food you can take away and enjoy at home. You’ll also see some small plate and music evenings, where you can enjoy Pembrokeshire-inspired tapas food with some great music after everyone’s finished eating. And don’t forget, our Christmas Menu is ready for our Christmas Party Nights on selected Thursdays during December, so if you’re planning an event for work, friends or family, you’ll have a fantastic night with us. We’d love for you to pop in to see us and book a spot. Why not keep up to date with everything on facebook and our new events page on the website?